Social media has become intertwined with all aspects of modern life. In recent years, Facebook, Twitter, Pinterest, Instagram and blogs have become widely used for all sorts of milestone announcements. It's not unusual to see weddings, birthdays, anniversaries, births, graduations and other achievements celebrated online. But what about funerals? Is it appropriate to announce a death, or commemorate a deceased person, in the digital space? Short answer: it can be done, but proceed with caution. Issues surrounding death and dying have traditionally been treated with great care. That's because emotions are running high when a loved one has passed. Social media has rapidly become a leading way to announce a death. It can be a fast and efficient way to let loved ones know when a tragedy has occurred. It can also be less draining than notifying every acquaintance personally while in the thick of grief. However, in order to be effective and appreciated, posting about a death requires sensitivity and tact. 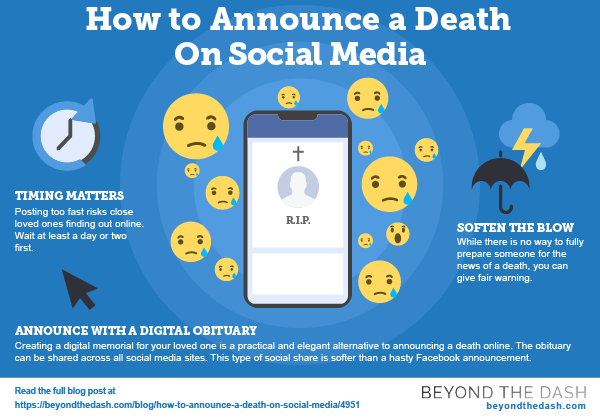 Here are some tips for deciding whether to announce a death online, and ideas for using social media when someone has passed away. People who were very close with the deceased person, including relatives and friends, should be notified in person, or via telephone at the very least. There is no good reason for letting people find out while browsing the internet that their best friend, grandmother, son, or significant other has passed away. Make sure you make contact with all of the closest people to the deceased before posting anything on social media. The first 24 hours following a death are a period of shock for most people, whether the loss was expected or unexpected. If you choose to announce a death on social media, wait at least a day or two first. Posting too fast risks close loved ones finding out online, and can lead to confusion or panic for loved ones trying to organize funeral arrangements. 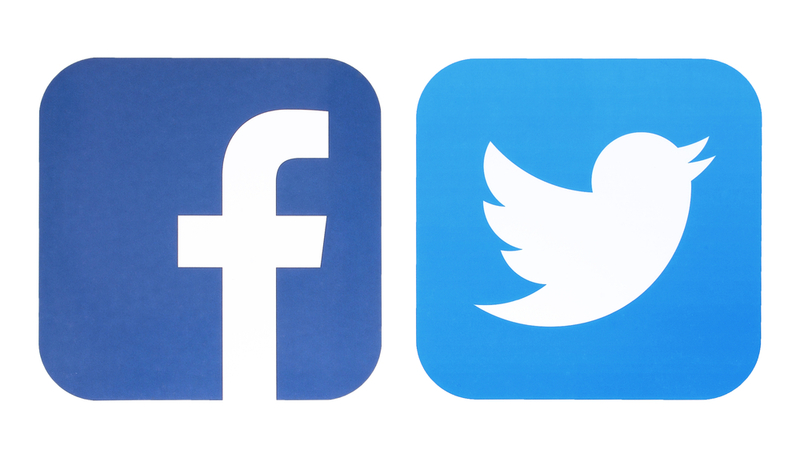 Once those closest to the deceased person have had some time for the news to sink in, a short notice on Facebook or Twitter could be a way to make sure everyone has a chance to plan for the upcoming funeral. 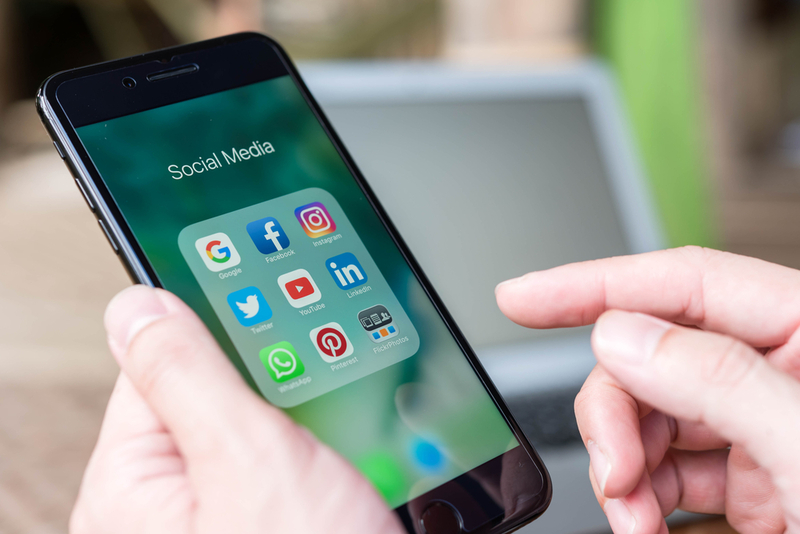 As people use mobile phones and devices more often to manage social accounts, there is a higher likelihood of people reading this post while on-the-go. Imagine finding out a close friend has passed away moments before an important work meeting, wedding ceremony or final exam. Giving readers the opportunity to postpone receiving bad news is a courtesy you should afford them. If they choose to continue reading, the warning will soften the blow. Announcing a death on social media is absolutely the time and place to provide a warning to readers that the post they are about to read contains sad news. While there is no way to fully prepare someone for the news of a death, you can give fair warning by stating, "Family and friends, it is with great sadness that our family announces the passing of a very special person. I apologize for posting the news this way, but I wanted to make sure everyone hears before the funeral." No one is ever really prepared for tragic news. But by giving your network a heads up before launching into a death announcement, you can rest assured you're not making a negative experience worse. You should consider the age, social media presence and your knowledge of the deceased person before announcing their death on social media. Did they post often? Perhaps it makes sense to share the news through a post or tweet. Some people have many close online friends who they never met in person. Are there unknown people left to notify, who would be easily reached by a public post? Posting online may be the only way to ensure everyone who needs to know is notified. If the deceased was not an active social media user, posting the death announcement on social media might not be the way to go. If everyone who was close to the deceased person are easily contacted individually, it may be best to avoid a public post. A Facebook or Twitter post announcing a death should be factual, rather than sentimental. Although you will likely receive an outpouring of sympathy from your connections—whether they knew the deceased person or not—the death announcement is not the time to ask for attention. In general, it is good to take your peripheral connections into account before posting anything online. When posting, don't think about what your best friend or partner would think of your message. Imagine the relatives you see once a year, or acquaintances you made through clubs or hobbies. If these people are connected to you, they probably see what you share. Comments are usually not moderated unless they violate the Facebook or Twitter terms of service. Posting a death announcement on Facebook directly can open up the conversation to trolls. By posting on a site that does not provide content moderation, you could be inviting negative comments toward survivors or your deceased loved one. Creating a digital memorial for your loved one is a practical and elegant alternative to announcing a death online in a post. Creating an obituary before sharing on social media carries on age-old traditions of death announcements, in a modern way. And by starting with a more formal obituary, you can avoid a serious social media faux pas. If you aren't ready to write the full obituary, start by creating a short death announcement, complete with a photo of your loved one, and the ability for guests to post condolences which are vetted for appropriateness. When you are ready to tell the full story, you can return to the memorial and elaborate on their achievements, survivors, and the life they lived. Once complete, the obituary can be shared across all social media sites. This type of social share is softer than a hasty Facebook announcement. Consider placing a death announcement or obituary on Beyond the Dash before posting directly on social media. Our digital obituaries are free to post, easy to customize, and you can choose to place a print notice in over 6000 newspapers across North America once you are done with the online version. Letting people know of a death via social media can be a better alternative to letting them find out weeks or months afterwards. People should have the time and space to grieve, and posting online may be the most effective way to ensure the sad news gets out. However, you don't want to put them in the position of finding out about the death in public when they are emotionally unprepared for the bad news. Make the decision about whether or not to announce a death on social media on a case-by-case basis. Before posting publicly, make a strong attempt to notify those closest to the deceased person in person, on the phone, or via private message first. When in doubt, first create the digital memorial to announce the passing with tact.